I’m gonna lose my religion . . . I was raised as a Southern Baptist which is damn near the same as being in a cult. Not to be confused with Fundamentalist Southern Baptist. As a child I used to pronounce it Funny Mentalist which is a far more accurate description. Baptists had some crazy rules when I was a kid. Women couldn’t wear pants to Sunday morning church, but it was ok to wear them to Sunday night church if you were a female child. Wednesday night’s youth group it was ok to wear whatever you’d gotten by with at school that day – even shorts! But heaven forbid we visit another Baptist church on a Sunday evening. Mom would say, “I don’t know if they allow pants for women so we need to wear dresses.” I was very confused. I even asked, “Mom, why won’t God let me into heaven if I wear pants to church? Doesn’t he see me naked in the shower?” Never got an answer to that, but it could have been one of those times a preacher would’ve cussed. And speaking of a preacher cussing, I never witnessed that, but I knew plenty of Preachers involved in scandal. Not all were Baptist. Of course you may remember Oral Roberts or Reverend Jim Bakker, but I knew some preachers in my home town that ran off with the church secretary or were voted out in a secret, midnight Deacon’s meeting because he was doing a lot of “counseling” with the Widow McAlister late at night . . . at her home . . . unchaperoned. Now let me assure you that there are good people in church. Real good people. My next door neighbors go to church every Sunday and there aren’t any better people in the world. Mr. Jake donated one of his kidneys to his brother-in-law. HIS KIDNEY! I don’t even give away my good Rubbermaid containers! But there are good people everywhere. On a bus, in the airport, at the grocery store, even working in banks! Just because you go to church doesn’t mean you are a good person. Some of the most evil, degenerate, conniving people I’ve ever known were leaders in their church. Even Jesus preferred to hang out with thieves and prostitutes. They were more honest and trustworthy than the leaders of churches in those days too. But there are some things so deeply embedded in me from church that I can’t get them out of my head no matter how hard I try. I believe there is a Satan and I believe there is a Hell. Another blogger, Cherie Roe Dirksen disagrees and makes some fine points in her recent post. As much as I want to believe there’s not a hell and that no one is keeping track of my rights and wrongs, I just can’t. There’s even a little solace in believing there’s a Hell. When I see a news report of someone who’s tortured children, raped, murdered or injured people, it eases my mind that they will burn in a lake of brimstone and fire for all eternity. It gives me a warm, fuzzy feeling inside. Now-a-days I don’t attend church so technically I don’t have a “religion” to “lose”. Don’t get me wrong, I’m still spiritual, I’ve just been disappointed by too many people in churches to feel the need to go there to commune with God. I don’t hold anything whatsoever against those who do. I don’t assume you are a judgemental, overbearing zealot just because you get up every Sunday morning to go worship. Let’s just agree that you won’t assume I’m a thief or a prostitute just because I don’t. Oh Lord, that last line was probably enough to make a Preacher cuss! This entry was posted in Life and tagged Baptist, God, Hell, Humor, Jesus, Jim Bakker, life, Religion. Great blog, thanks for the mention. This is such an emotive topic this. I was raised a Roman Catholic but I also refrain from going to church now. Like you said, I also see myself as spiritual and you don’t need anybody telling you how to be that! You do what your heart tells you to do. That, for me, is listening to ‘God’. For all those people out there who seem ‘evil’, I just believe they have to walk through more lessons to be able to find their own piece of God within (no matter how many lifetimes this takes — yes, I do believe in reincarnation and quite frankly that, to me, is a form of hell — can you imagine having to come back and do it over and over! The fiery stereotype version of hell seems like a holiday camp! LOL). Everybody has that shard of divinity, although some bury it so deep down that they even convince themselves it isn’t there. 🙂 Thanks for sharing your thoughts…there are so many people out there who need to talk about this and hear different views. You are very welcome for the mention although I don’ t get a lot of traffic so I’m not sure how appreciative you should be. I was very intrigued by your blog the other day. Beautifully written! It definitely made me think and dig a little deeper into why I believe the things I do. And you are so right that reincarnation could be a form of hell. Oh “AMEN” to that! Okay, now you’ve gone and done it! You’ve made my blogroll! I’m very flattered!! Thank you very much. Thoroughly enjoyable read and I totally agree with your sentiments. Smiled at your Mom’s “Think I’m gonna lose religion”. My mother, a strict Methodist also had ways of very narrowly missing the correct pronunciation of swear words so God wouldn’t be offended. I’d also like to add you to my blogroll…..you have a very entertaining writing style. Why thank you so much, I’m honored! 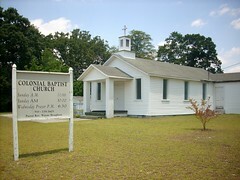 My mother was raised Methodist and converted (ha ha – there’s no conversion process) to Baptist when she married my Dad. My Dad had no problem swearing, but he served in the Navy.